Cameron's been working very hard, getting used to his new leg braces. He will be wearing them all day, except for during sleep, to help correct the way he walks. It's been a tough transistion for him, but like every other challenge, he will conquer it. The biggest challenge for Chris and Jane was finding shoes to fit over the braces... since Cam's regular shoe is a 4w, his new shoes are 7 extra wide- thanks to Sears for being one of the only places to carry the unique size. Another accomplishment for Cameron this week was saying goodbye to his last bottle. He was still drinking a night bottle before bedtime, but now he has his ev ening milk in a cup with a straw. He handled that change like a champ! With all of Cam's hard work, he had playtime as well. 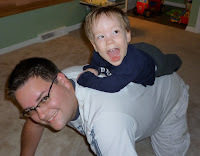 'Horsing' around is a favorite activity for Cameron & his Dad and piggyback rides have now been added to the list!